7 months ago, I started running after dreading it and publicly detesting it for years. One day late last year one of my closest friends, Mark, asked me one of the worst questions I think he’s ever asked to me, “Will you run the Brooklyn half-marathon with me?” Ugh. My initial internal reaction was F*&k no! The thought of running made my face contort and my body tense up. Nothing fun or good was personally associated with running. None of my thinking was logical this I knew, which kicked off a moment of self-awareness. Self-awareness was instilled in me by my mom at a young age. I am forever grateful for that and it, for it has always propelled my growth. Whenever I have such strong, negative, illogical reactions to something I’ve learned I should investigate because a lesson awaits. Why I didn’t want to run and why I didn’t like it were part of my investigation. In high school I would run as part of my PE class where I preferred sprinting to distance but wasn’t sold on either. It felt boring, solitary, as if there was a false sense of exploration. I would begin to see the area in which I was running and find new interests but then… Sprinting was brief and when I ran longer distances I yearned for a slightly faster way to see and experience where I was running. This is one of the reasons why I like cycling. The rewards of exploration come swiftly. Previously I’ve read, watched, and listened to runners, especially distance runners, on the reward they get once they get past themselves and their thoughts. With cycling or hiking, for me the reward happened immediately regardless of me. Most importantly, running expended a lot of effort. Too much in my opinion. And that was it. That was my insight. I didn’t want to put in the work, which is ironic because I walk and hike long stretches, I’ve participated in bike tours, and I’ve even climbed Mt. Kilimanjaro. Keeping what I learned in mind I prepared myself to accept the challenge. With a defiant tone I responded, “Fine” and opened myself up to the world of running and putting in the effort. Initially when I accepted the challenge I tried to get other people to join as well, believing that a group effort would help to raise my own personal effort. Also, since Mark and I don’t live close to each other, I thought it would help with holding me accountable to training and having peeps to train with. Yeah, no one else was into running a half-marathon. That meant I was in it for myself and that my perspective had to shift. Even though I would be training solo, I knew I still had a tribe that I could depend on. My tribe comprised family and close friends and would end up supporting me virtually by providing encouragement, humor, and a silent agreement to hold me accountable. Without prompting, I would send them photos and videos from my run and progress reports by way of screenshots of my Nike+ Run Club app. According to some of them I in turn provided motivation, examples of going after personal goals, being dedicated and just plain old doing it. I knew if need be the tribe would also be there on race day, with signs, cheers, and encouraging energy but once I got into the groove and habit of conquering running solo, similarly I wanted to conquer the half as solo as possible. 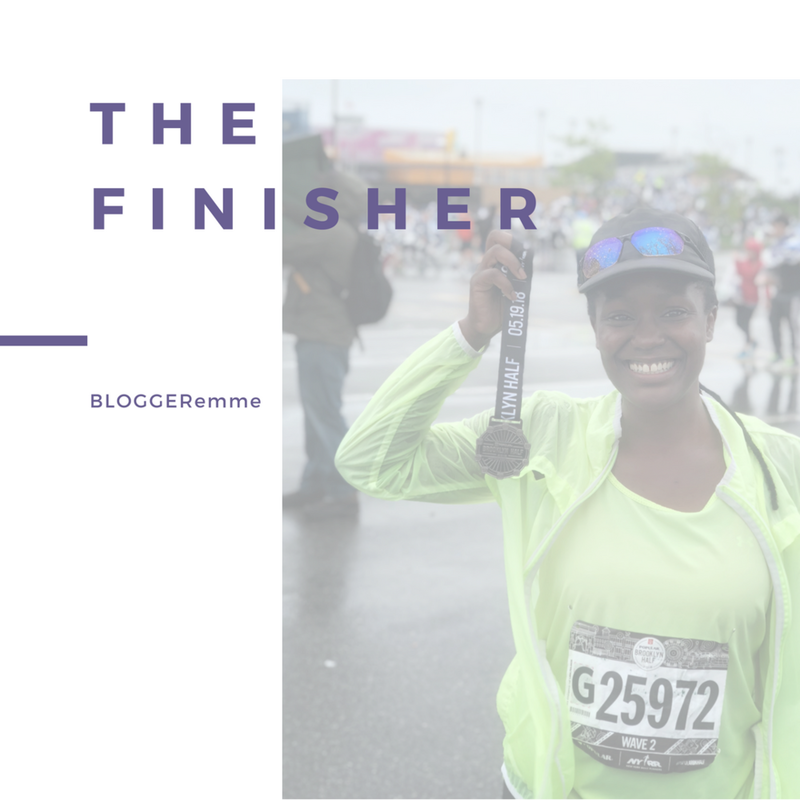 To be honest I didn’t do a lot of research for running and partly because I went into this thinking that I wasn’t a runner, that I just wanted to support Mark, finish this half-marathon, and learn more about myself. Plus I knew I was going to use the Nike+ app, so I didn’t feel compelled to spend more time on this since I was going to be finished with it once I crossed the finish line. My training was spotty at best up until about 5 weeks prior to the half. For the first six months I would run most weeks at least once or twice. There was that three-week freezing spell here in NY where I would not go outside, let alone run. I did work out at home some, but that still was not the same as putting time on my legs and mind. Run. Walk. Breathe. That was the plan. It took me a while to accept that partially walking in a running event still meant I ran the event. My thought, since I was younger, was that I had to run the entire way. This was not true and not helpful, so I discarded that thought. From the start I ran for 15-20 minutes and then would walk for 2-3 minutes. This helped me keep my energy level throughout the race and maintain a good pace. Form maintenance and deep breathing were also part of my plan to finishing feeling great. This next point might sound...who cares. It helped. My plan was to smile throughout the half, and not a fake smile, but a genuine smile. Smiling was not for vanity reasons alone but it kept my spirits high. The first time I smiled during the half, a mantra automatically came to mind and flowed through my lips, “This is not that bad.” Everytime I said it, I smiled harder and felt more at ease, as though a burden had been lifted. An article from the New York Times speaks about a new study from researchers from Ulster University in Northern Ireland and Swansea University in Wales showing that smiling increased efficiency probably by helping runners to relax. There was not one time during the race where I felt bad. Not one time when I felt I could not continue. The more I breathed deeply and smiled, the better I felt. Flowstate. Being in the zone. That state where things are moving and time is going at the right pace; where you feel fully energized and focused; where you control the flow. I experienced various levels of this throughout the run. Let’s be clear though, the pre and post parts of the race were brutal. For at least an hour we stood in non-stop rain waiting for the race to start. 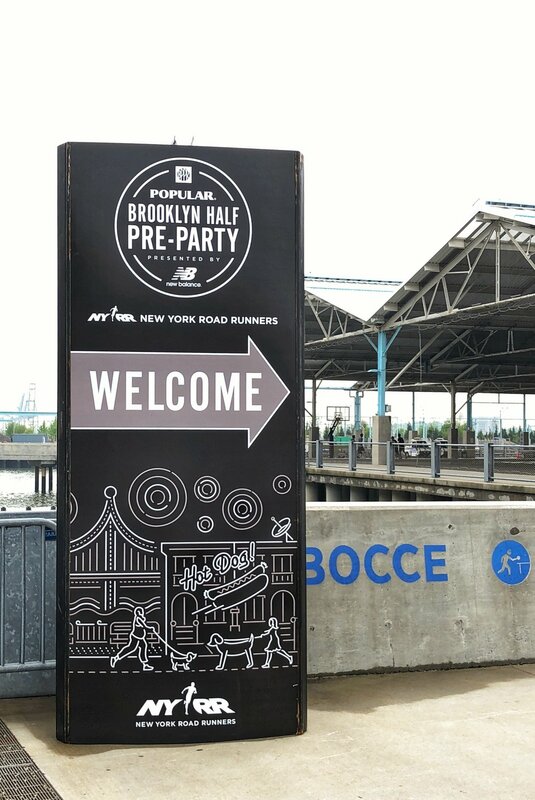 Since this was my first one, I listened to the instructions given to me when I picked up my bib, "...arrive at 6:30 AM" 🙄. That meant at least 1 hour and 15 minutes to get through security, find my coral, find Mark, and go. Aside from the finding Mark bit everything else took approximately 15 minutes total. By the time the race started my fingers and toes were numb. My arms had started numbing as well, and I could barely extend them without feeling a strong tingling sensation shoot through them. Jumping, shaking, praying, meditating, none of that helped me to get into a state of flow. All I could focus on was being soooooo cold. When I first arrived at the coral I saw runners taking shelter in the port-o-potties. When I finally used one pre-start I understood why. It was a legit, albeit stinky, shelter, and they had reached their limit. I was not there yet. My mind started second-guessing my clothing choices, wondering if I would make it to the end? Thankfully at this point we started moving and once I started running, I took in the scene and the energy of the runners and the spectators and let it be a part of me. I was in a zone. It was awesome and carried me for about 3-4 miles when a friend ran past. We ended up running for nearly 6 miles after I called out his name. Throughout we had a meaningful conversation, which helped to distract me from the hills of Prospect Park. When he left to run back home, I was back on my own. With a renewed energy, I put some music on and began to have fun. Singing aloud, running in patterns, pumping my fists, and smiling are all ways in which I expressed the freedom in running I was feeling. It wasn’t an effort at all. The work that I had put in was a distant memory. I am a runner. While I don’t love it, I do like it a lot. I appreciate knowing that I can run anywhere, anytime, and depending where on this Earth, anywhere. Special thank you to my tribe. With you I am even more amazing than I could ever imagine being.